Before I’m done, you’ll be a street smart business exec with a network of a Harvard graduate without the $150,000 school loan. Yes, we all bought a badge to Austin’s annual SXSW so lets make this real world tuition pay a big return. Your ROI comes from not only seeing great panel content, but also getting into the best events. Here are some ideas from me, the party king, to you in maximizing your SXSW party experience. Here are five tips so you can be the party guru of SXSW without having to hire, woo or charm me. First step is to RSVP right and RSVP early. Do this and make a positive impression before your first impression. Also, using social media you can make a positive impact with a two sentence tweet. -2- Apply for the Waitlist. Your RSVP to a sold-out event can be facilitated by applying for the waitlist. Once you are confirmed on the waitlist, add a little value and if you also show up early for the event, you might migrate yourself from pseudo crasher to VIP. Crashing is so much easier if you are gate crashing from the waiting-line. It does not matter if it is a cupcake social for 20 people… hosting something helps. The first people that get invited are other people that host. Me, I hosted a VC panel last year because entrepreneurs needed to learn about money, financing, getting VC meetings and money. Because of hosting that panel, I got invited to a ton of VC events across from across the country. I am hosting a VC party at SXSW called, “Reverse VC Pitch Party“. It is where VCs will pitch us entrepreneurs. I am not inviting any of the “9 VC’s You’re Gonna Want To Avoid“. Networking with VCs by dreaming up genius events is stuff that business school will never teach you. People want to know what you stand for and what you need. The “I’m just here to check stuff out” routine is not good. I recommend selling something for free or promoting something your friend did. An example is Danny McBride last year who was at my SXSW Film afterparty. When I met him walking without his entourage, I man-charmed him. He reciprocated by telling me he was promoting a film project for a friend of his that had an entry. Me, I use and advanced strategy of selling something of extremely high value for very little money. For example, I will sell a multi-month credit consulting package for a person trying to improve their FICO for just $9 per month with a two month pre-pay. So for $18 payable on-the-spot, I can see if I have established in their minds that I am a credit expert. Another example is selling a $2k party sponsorship for $60 if the founder can pay on the spot. Plus, I offer their $60 back if they actually show up. I charge $60 because it makes them team up since most 20 something tech founders don’t carry much cash. It doesn’t help because I really don’t want to be the party king. The old way was, “It’s not what you know, it’s WHO you know”. The new way is, “It’s who knows what YOU are an EXPERT in”. 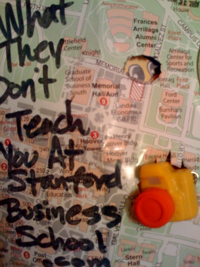 B-schools hone and hark on business models. – Killer Party Tip #1: I take my ‘fee’ to be sponsorships that I, in turn, give to entrepreneurs. For example, Canaan wanted me to be their Creative Director their Web 2.0 Summit After Party. I took my fee and gave it to VentureBeat to give away to their entrepreneur readers. – Killer Party Tip #4: I tip out the staff at the venue because I read the post, “How to Tip, Bribe, Comp and Tip Your Way Past 100 Harvard MBAs”. 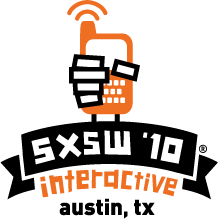 – Killer Party Tip #5: Have a campaign of parties during a conference, like SXSW. The old way was one splash. The new way to control the entire conference using a sequence of events. Q: How did you get to this position. Q: What ideas do you have for a company doing last minute party planning? Q: What are your thoughts on crashing since you’re notorious. Chip in your questions in the comments! I founded Duck9, which educates college student on credit cards and how to establish a FICO score over 750. I have testified before Congress and World Bank on credit. My earlier posts include: How to Work The Room and 8 Tips On How to Get Mentored.